I'm wondering if the mini console was standard equipment on cars with standard interior or was there none at all? I have looked at a bunch of Marty reports and don't recall seeing it listed on any. The center console is listed though. I have my dealer invoice with no mention of any console. I am a purist and was just wondering. The mini console was standard equipment in both standard and Mach 1 sport interiors. The long console was an extra cost option. I have two 71 Mach 1's with the Mach 1 sport interior. One has a mini console and the Marti report makes no mention of it since it is standard. The other has the long center console and it is listed in the Marti report along with the other options. Hope this info helps. I could see that being so but I have a 73 convertible 48,000 mile original that had no long console and no holes where a short or long was ever installed. There is no ash try otherwise but it has a cigarette lighter. It is the deluxe interior also. Need the salesman's book to know what is what. I will go look at the showroom brochure and see if it says anything. I also have a special order black vert that did not have console and Marti does not show anything either. It is deluxe interior with gages but not heavy on options. i have to look in my sales books, but i have seen a marti report showing the mini console on the build sheet for 71-72 cars. for my car it lists the long floor console as built from the factory. i think it was part of an option group. i know it wasn't part of the convenience group, maybe it was part of the A/C group. i have the book somewhere in my house I'd have to look for it. i know this changed for 72.
then ford hosed you on either ordering the mini console or getting the long console as options. this was on top of the option of standard or deluxe interior. To my knowledge, the mini console was standard in all 71-3 Mustangs unless the long console was opted for either through model selection or a check box on the order sheet. I've never had a 71-3 that didn't have one style of console or the other. FWIW, not having any type of console would have eliminated the ash tray - completely unacceptable in the early 70's!!! My 73 Vert has the long console with clock and it listed on my Marti and sticker. The cost was 67.95. Hemikiller;242366 Wrote: To my knowledge, the mini console was standard in all 71-3 Mustangs unless the long console was opted for either through model selection or a check box on the order sheet. I've never had a 71-3 that didn't have one style of console or the other. Agreed it would be blasphemy for a car in the 70's to not have an ash tray. I know you stick your neck out when you say that's how something was on a car. I will say from owning, seeing them at a Ford dealer, helping judge them at MCA shows, and friends that owned 71,2,3 Mustangs that I have never seen one that was original and did not have one of the two consoles available. 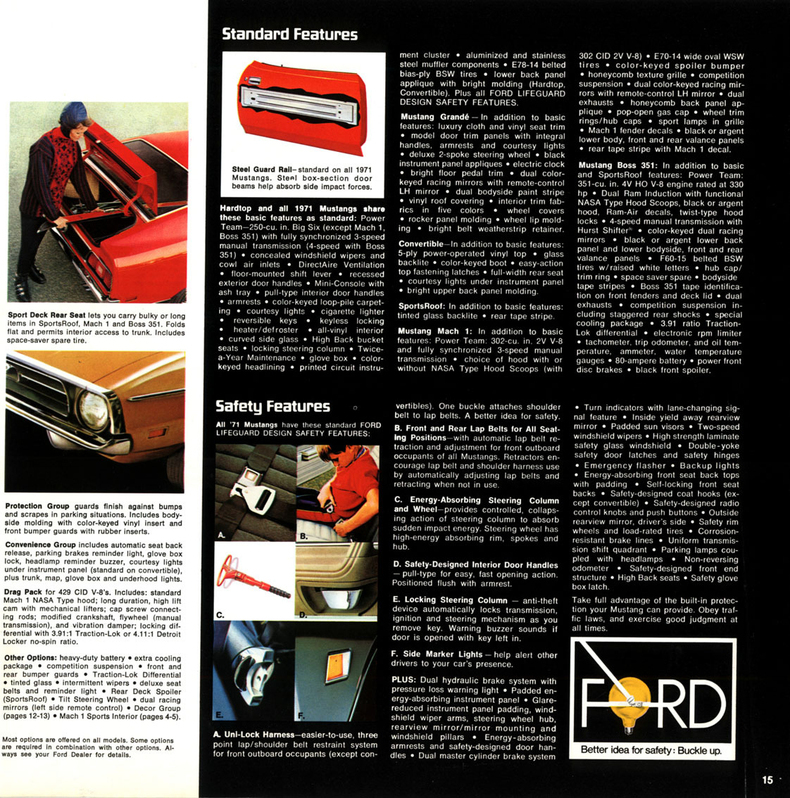 It does say in the 71 and 72 order guide that the mini console was standard regardless of the trim level or model of the Mustang. I do not have my 73 info with me. Got to remember that 1973 was the Swan Song" for this generation Mustang and variances abounded as Ford did what ever it took to get these cars out the door. The oldest Mustang in 1973 was only 8 years old and the assembly line workers were not concerned about "correctness". All they saw was an endless line of cars that could of been station wagons as far as they cared. Their job was to get them out the door. So...that's my story and I'm stickin' to it! I did find a 73 showroom brochure and the mini was standard. I guess the PO of the 73 vert I have got shafted. I will have to pull the carpet again and make sure there are no holes from console mount. You had to have an ash try to put the roaches in, lol. Use to pull the ash tray out and hide stuff behind it, those were the days. Pink Floyd on the 8 track cursing down the road. That is how I was told it was I never inhaled, I went to same class as Clinton did. Thanks all for the discussion. I was confused after seeing some pictures with only the shifter bezel. Based on what was said here, I think I will re-install a mini console in my 72. Got a real nice one from a member here that I re-coated. The car had one in it that was likely original but hard to be sure since the car had other things added to it like side stripes. My car has mini console and no mention on Marti report.